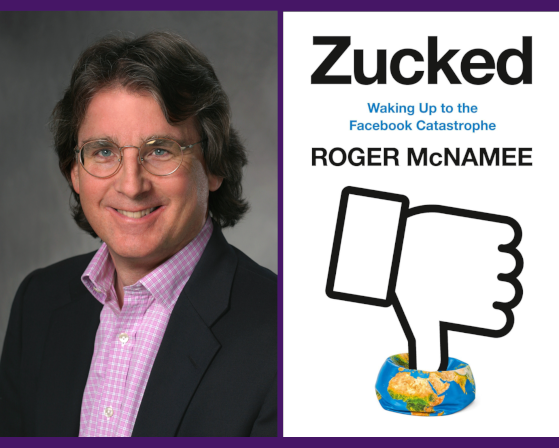 Roger McNamee, a Silicon Valley venture capitalist for more than 35 years, was an early mentor to Mark Zuckerberg and a significant investor in Facebook. McNamee grew concerned when the company's leadership changed its business model and turned it into what he sees as a "clear and present threat to democracy." “The internet platforms have harvested 50 years of trust and goodwill built up by their predecessors,” McNamee writes in Zucked. In a recent interview with Fortune magazine, McNamee said Zucked is "about how a toxic mix of uncontrolled capitalism, extraordinary technology, and a culture that says you’re not responsible for the consequences of your actions that can do great harm." In a New York Times review titled "An Anti-Facebook Manifesto, by an Early Facebook Investor," we read: "McNamee’s book is not merely the cri de coeur of a forsworn tech optimist zinged by moral conscience. It’s also a robust and helpful itemization of the ways Facebook could be brought to heel. McNamee clearly believes the company can be made into something more benign, and perhaps even socially beneficial." Financial Times praised Zucked as "A timely reckoning with Facebook’s growth and data-obsessed culture. . . [Zucked] is the first narrative tale of Facebook’s unravelling over the past two years . . . McNamee excels at grounding Facebook in the historical context of the technology industry." A child of Albany, NY, McNamee is also a musician and leader of the bands, Moonalice and Doobie Decibel System. In 2004, McNamee co-founded Elevation Partners along with a number of other investors including U2 frontman Bono. He served as technical advisor to the HBO series, Silicon Valley, and is a board member and special advisor to the nonprofit Wikimedia Foundation, parent of Wikipedia, and an organization whose mission is to bring free educational content to the world.